Veterinary science has shown there are several steps each dog owner must take to ensure proper canine health. A well balanced diet of a high quality dog food, the right amount of exercise for their breed, proper nutritional supplementation, and lots of love and attention from their owner are a few of the keys to a happy healthy dog. Our Blue Box Bundle offers a complete approach to canine supplementation, at a substantially discounted price. For a dog lover who is just learning about the need for supplementation, this product bundle provides everything they need to get started. Dog owners who currently have nutrition plans for their dogs know how valuable each product in the bundle is to the health of their dog. HardyPet Multi-Vitamin - Made with over 40 pharmaceutical grade ingredients, this combination of holistic natural compounds, amino acids and broad spectrum vitamins provides the essential nutrients all dogs need to achieve optimum health. A daily chewable multi-vitamin most dog's think is a treat, it helps with issues related to skin/coat, digestion, heart health, immune function, and joint health. There is not a more complete canine supplement available. Choose the formula that is right for your dog's needs. HardyPet Canine PRO6 - There are 6 strains of naturally occurring "friendly bacteria" in the canine digestive tract. These bacteria are vital to proper digestion and immune health and are under constant attack from candida yeast and others. Providing your dog with a daily source of the flora they need will help combat yeast overgrowth, balance the pH of the intestinal tract, optimize nutrient absorption, and improve overall immune function. Providing a canine specific probiotic is an important key to every dog's health. 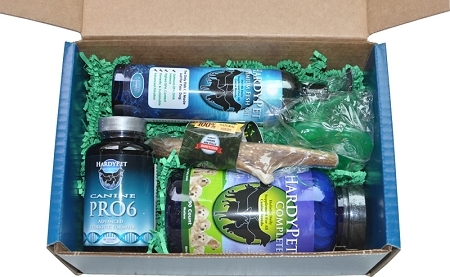 HardyPet Premium Fish Oil - The health benefits of fish oil for humans has been well known for decades. These same benefits apply to dogs and are even more significant in certain areas of canine health. The Omega-3's found in fish oil play a large role in how their immune system produces natural anti-inflammatory compounds, neurologic and eye development in young dogs which can affect them later in life, maintaining good heart health, and helping older dogs with a variety of issues. The key to these benefits is using a fish oil with the right EPA/DHA balance for dogs and always giving the proper dosage. There is a limit to the amount of Omega-3's a dog can have in a day and HardyPet Fish Oil is packaged with a pump that delivers a precise amount each time. Together with the dosage chart on the label, owners are able to deliver the right amount of Omega-3's every day. HardyChews - Keeping a dog mentally sharp and happy is important. There is nothing better than seeing our dogs playing with toys they love. The challenge with many toys is their durability and safety after use. HardyChews are made from natural deer antlers which are naturally shed each year in the wild. These antlers are collected, properly sized, sharp edges removed, sanitized and sealed. Because of the natural toughness of antlers, HardyChews will not splinter and last longer than any synthetic toy. Dogs instinctively love antler chews and will chew and play, day after day. Choose the right size for HardyChew for your dog's size. HardyPet Bag Clip - Keeping dry dog food fresh is important and something as simple as a bag clip makes a big difference. Our durable bag clip comes with a magnetic backing to attach to a refrigerator or other metal surface when not in use. 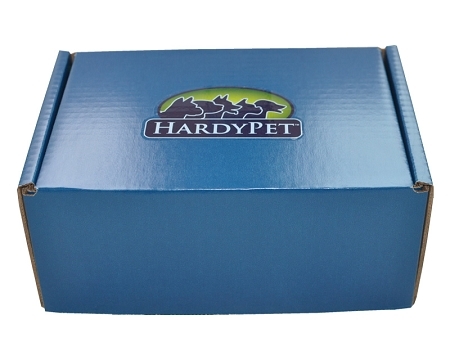 There has never been a collection of canine health solutions assembled into one bundle which has done more to improve canine health than the HardyPet Blue Box. Meant for all breeds and life stages, the products contained in the Blue Box are designed to improve and maintain an optimum level of health.